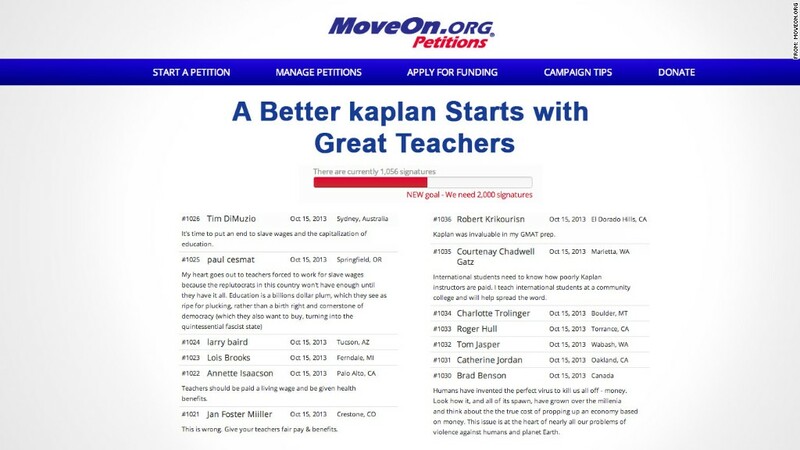 This petition to increase pay for Kaplan teachers has drawn more than 1,000 signatures. The 90 Kaplan English language instructors who voted to unionize last year thought it would lead to higher pay and benefits. But 17 months later, the union and Kaplan have yet to agree on a contract, and nothing for them has changed. All their hopes are pinned on their next negotiations on Oct. 25. Emily Lessem, 29, who has taught English to foreign students in New York for nearly two years, was one of the instructors who joined the union in June 2012. Like the other instructors, she only works 30 hours a week and is considered part time. This means she doesn't get benefits, a strategy that the union said Kaplan employs on purpose. But Lessem still gets paid about $21 an hour for her in-class teaching time. For the rest of the job, which involves grading and lesson planning, she is paid New York's minimum wage of $7.25 an hour. She doesn't get paid for sick days, vacation days or holidays. And there's no healthcare insurance. Her take-home pay for the year is about $23,000, not enough to pay the bills, she says. "I really enjoy teaching ESL but I've been very frustrated with the working conditions," she said. "I've been really cheated out of a lot of money and benefits." The union has spent the last year asking for higher pay, benefits and paid time off, but the two sides haven't been able to agree on a contract. Bill O'Meara, president of the Newspaper Guild of New York, which is representing the New York instructors, said negotiations have stalled because the company won't agree to their terms. "These are people who have master's degrees, who bring in a ton of money for Kaplan because the ESL courses are so expensive, and yet they're getting minimum wage to grade essays and no benefits," he said. A Kaplan spokesman said that negotiating takes time, and that labor laws limit "the circumstances in which Kaplan can make changes to wages and benefits while negotiations are ongoing" for the New York workers. But Kaplan instructors in other parts of the country have seen changes since the New York teachers unionized. O'Meara said that two months after they voted to unionize, prep time pay for Kaplan instructors in other parts of the country was raised from minimum wage to $12 per hour. "We think they were trying to set an example and stop other Kaplan centers from organizing," he said. Among the union's demands -- increasing pay for teaching time to about $22 an hour and for grading and prep work to a minimum of $13. The union is hopeful of a positive outcome when it meets on Oct. 25 for negotiations with Kaplan Inc., which is owned by the Washington Post Company (WPO). In the meantime, it is trying to ramp up public pressure on the company. The group created a Facebook page and a petition on moveon.org, which have more than 1,300 likes and more than 1,000 signatures respectively. Lessem and the other instructors are hoping that more support will force Kaplan to agree to a contract this time. "I'm hoping for Kaplan to actually acknowledge the workforce and value us, offer something that's a livable wage and fair working conditions," she said. "And hopefully we can inspire other people in the for-profit education industry."